These turkeys have been in my family forever. I'm not even sure the first time we made them. It was probably when I was a kid around the Thanksgiving table. After the turkeys are made they are edible too. Each child gets an apple. The raisins are used for the feathers. 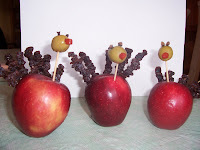 The children will put raisins on the toothpicks and stick them in the apple to make them look like feathers. There is really no set number--you can make as little or as many feathers as you like. 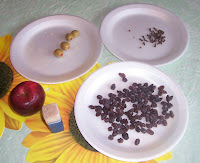 After the feathers are in, take one green olive and carefully pull the pimento out a little bit so it can be seen well. Then have the children push two whole cloves into the olive for eyes. 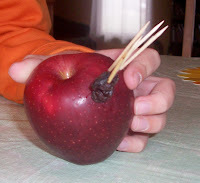 Push a toothpick into the apple and put the head on top. You're done. I think they are pretty cute. I have, some years, made the turkey's head out of a mini-marshmallow, cloves, and a piece of red licorice. The children eat the marshmallow more than the olive, but personally I like the olive effect better. Have fun! 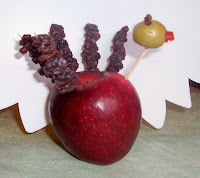 Apple Turkey Update: Today, Nov., 20, my son came home with a version of the apple turkey that I wanted to share with you. It is the same concept, only some sweeter additions. 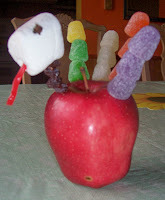 The children used gumdrops for the feathers, a large marshmallow for the head, and a red licorice for the wattle. Looks good and smells great too(spicy gumdrops). Might not be as healthy as the first apple, but I'm sure they'll enjoy making it just as much.